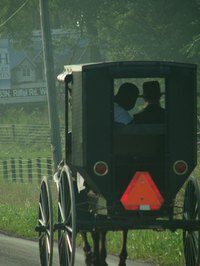 According to Dr. Alfred L. Shoemaker, the Amish bonnet is based on the earlier Quaker version first introduced in Pennsylvania around 1800. Amish female garments are characterized by their balance of modesty and practicality. Bonnets are meant to cover braided or bunned hair, protecting the scalp from the sun, and feature very little ornamentation. This simplistic aesthetic makes it easy for you to make your own Amish bonnet at home. Cut open a brown paper bag so that you have one large piece of paper. Lay this on your work table. Cut out a square that measures 17 inches by 17 inches. Fold the square in half, then fold it in half width-wise. Open the paper, but retain the middle fold. Lay the paper so that the fold is on the right and the edges of the paper are on the left. Put your pencil on the crease which runs across the paper's width, at the very edge of the paper. Draw a smooth curve from this point up to the top of the fold. Cut along this line and open the paper. If you have done this step correctly, you will have a shape that resembles a bullet. Cut a rectangle from the brown paper that measures 7 inches tall and 18 inches long. This will be the band. Cut three long rectangles from the brown paper that measure 1 inch by 20 inches. These will be the ties and the drawstring. Cut a rectangle that is 1 inch by 17 inches. This will be the draw through which you will thread the drawstring; this is how you adjust the fit of the bonnet's back. For a more exacting template, measure the wearer's head with a tape measure. A child's bonnet, for instance, will be smaller than the one described here. When making the actual bonnet, use a washable cloth like cotton, muslin or lightweight denim.